As brands look for more and more ways to ace consumer engagement, luxury brands too must find innovative ways to provide digital extensions to their onsite events. Swiss watchmaker Tag Heuer recently used the latest live-streaming technology to stage a live digital ‘in-the-moment’ social media experience for its luxury clientele who couldn’t attend its live event in Paris. 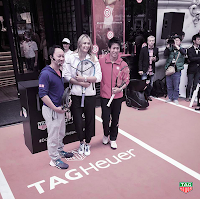 Tag Heuer hosted a tennis match outside its store on the Champs-Élysées, pitting brand ambassadors Maria Sharapova and Nei Nishikori against each other in a lighthearted game. By streaming the event on the mobile app Periscope, Tag Heuer ensured that consumers around the world would have real-time access to the event as it unfolded. The match was part of Tag Heuer’s “Don’t Crack Under Pressure” campaign which highlighted the achievements of professional individuals with stressful careers. Both Ms. Sharapova and Mr. Nishikori are global tennis sensations who have won many tournaments and frequently face intense competitive situations. The informal tennis match was staged on the street in front of the Tag Heuer store on the Champs-Élysées, a highly trafficked tourist destination in Paris, where many luxury brands have storefronts. The location attracted a large crowd, which Tag Heuer amplified by leveraging social media. The brand posted regularly about the match on Twitter, sharing pictures and links to the Periscope app live feed. Tag Heuer concluded the integrated offline/online experience by sharing images of the two players on its Facebook page, giving consumers the opportunity to engage on a variety of social media platforms. The Swiss watchmaker’s “Don’t Crash Under Pressure” video, which featured celebrities and highlighted accomplishments of the brand, achieved viral results in the five weeks post release earlier this summer. But this initiative wasn’t just about impressions, as the brand was able to effectively grow its customer database and hence its pool of potential new leads.